WED., FEB. 18, 7PM at Seventh Son Brewing. The event is free to the public. How does access to clean water impact a community? What is the role of Water for Good in the context of conflict? Water for Good has been focused not just providing access to clean water in rural areas, but making sure that the water keeps flowing through a maintenance program. Come and find out what it’s all about! David DeArmey currently serves with Water for Good to provide lasting access to clean water and hope to people living in one of the world’s most unstable countries, the Central African Republic. In the last year and a half, David has met with farming families in remote villages. He heard the stories of people who have been living in the bush, hiding from rebels. He made connections with the local cycling team and biked 100km through the streets of the war-torn capital city with the cycling team, aiming to promote peace. 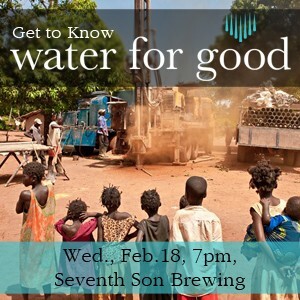 Please join David and volunteers from Capital City Grace Church to hear these stories and learn more about Water for Good and the Central African Republic! Water for Good will provide appetizers, sweets, coffee, tea, soda, and water. Other drinks are available for purchase from the Seventh Son team. Free parking lot at Seventh Son and in lot across N. 4th St.